I recently attended a leadership conference for members of the Nova Scotia Community College (NSCC) Student Association. Part of preparing for the conference required taking the Gallup StrengthsFinder survey (http://strengths.gallup.com/default.aspx). StrengthsFinder tells you what your top five strengths are, based on a list of 34 themes. It is important to know what your strengths are so that you can find work that suits them. Since your strengths are what you are good at it only makes sense for you to focus on them. It is a common misconception that we should focus on what we are not good at in order to improve it. Connectedness: Believe that things happen for a reason, and that we are all a part of something bigger like a spirit or life force. Futuristic: Loves to peer over the horizon to help predict what will happen next. Ideation: Fascinated by ideas and likes to look at situations from different angles. Empathy: Sensitive to the emotions of others and able to see the world through their eyes. Strategic: Can instinctively find the way through the clutter to the best path to take. Able to see around corners. I feel that these strengths are ideal for the type of work that I am going in to and for where I want to be later in life. Sustainability for me is something that is a necessity, not an industry. I do it because I believe that it is right, and for the greater good. This is because of the connectedness I have with the planet and other living things. The green building industry that I want to work in has come a long way in recent years but it still has a long way to go. This is especially the case as we prepare to make the leap from green buildings to eco-districts and green cities. The futuristic ability to see over the horizon will help me make innovative contributions and stay competitive. Ideation will couple well with that skill. My ability to look at things from different angles will allow me to come up with new ideas for things that have been done the same way for a long time. I’m entering an industry where old outdated practices reign. This skill will be essential to my success. My empathy is related to ideation in a way, because it lets me look at things from the same angle as others. I have always gotten along well with others, and I’m sure its because I understand them. This skill will help me immensely when I interact with co-workers and it will help keep the peace if things get stressful in the workplace. Strategic is the skill that will guide my decision making. I know where I want to be, and what my vision for the industry is. I’ll use this destination as the basis for my path to get there. Strategic is a skill that can’t be learned and I’m thankful that I have it. The leadership conference was great because it taught me what my strengths were, and how important it is to focus on them. By understanding them and how they can apply to my career I will be able to make the best contribution possible to my field. I drafted a Sustainable Purchasing Policy for my Campus’ Student Association and it was successfully approved by council this week. The policy sets guidelines that can be followed to ensure that items purchased have as little effect on the environment as possible. The goal is to reduce the waste we generate, support manufacturers who use recycled content, and support local businesses. The policy clearly states that it is a guideline and that it does not need to be followed. This is to ensure that the Student’s Association is able to function in its role. The policy is in place to get people thinking about how the purchasing choices they make can effect the environment. In my role as the VP of Finance I track and report all purchases, and with this new policy in place I will also be tracking which purchases meet the criteria set forth. We will measure our performance based on the percentage of purchases that are sustainable. There is currently no minimum threshold that we need to achieve, but over time we may adopt an acceptable standard. The purchasing policy was drafted using the LEED Operations and Maintenance guide as a template and it meets the requirements of Materials and Resources Prerequisite #1. Under LEED O&M a sustainable purchasing policy is mandatory, and you get extra points if you follow it. I feel that just by having one in place people are likely to follow it, and by not making in mandatory you are far more likely to have it adopted by building managers. I have uploaded a copy of the purchasing policy here. This week at my campus is Sustainable Transportation Awareness Week. I am on the executive of the student association and I am organizing this event. This week we are giving out prizes to encourage people to use sustainable transportation. I am also using the event as a learning exercise for LEED for Existing Buildings. The event kicked off on Friday with a transportation survey. The survey meets the requirements of LEED EB:O&M Sustainable Sites Credit #4. Normally there would be a mandatory minimum number of responses to the survey but we don’t have the authority to make it mandatory. We are also only sending it out on one day, instead of for an entire week like LEED requires. The survey should give us an idea of the times of commutes that students and staff take. We will be giving out a cash prize to one randomly selected person who responds to the survey. Every day this week you can be entered into a second draw if you use sustainable transportation to get to school. We will accept walking, cycling, or any other non-motorized transportation. Also accepted are hybrid or alternative fuel vehicles, and carpools of 3 or more people in a traditional vehicle. On Friday of next week we will be doing “Crazy but Safe Sustainable Transportation Day.” We will be giving a prize out to one random person who uses an unconventional method of transportation to get to school. Some examples might be roller skates, skip-it, or stilts. This day is designed to bring awareness to the need for sustainable transportation, and to be fun. The student association executive at our campus this year is made up entirely of students in the Energy Sustainability Engineering Technology program. I expect that we will have several new green events over the course of the year. 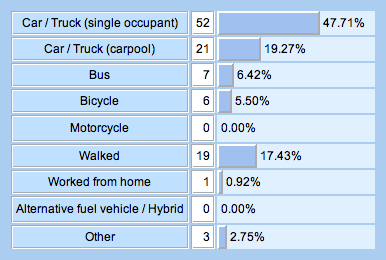 The results of our transportation survey.